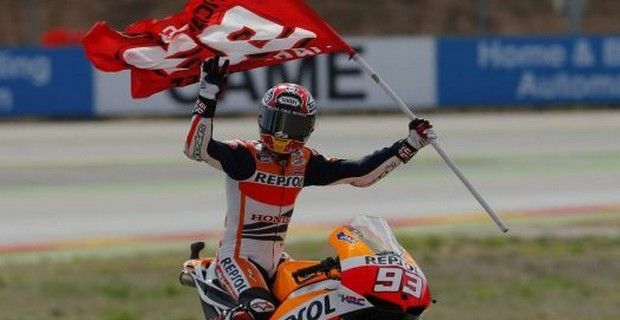 Marc Marquez took his sixth MotoGP victory on Sunday during the Gran Premio Iveco de Aragón in Spain by defeating Jorge Lorenzo, after Dani Pedrosa dramatically highsided out of the race. The Repsol Honda rookie who is re-writing the history books of GP racing took an even firmer grip in the standings as he now leads the series with a 39 point advantage over Lorenzo, while Pedrosa’s title bid took a nose dive after the crash. CLICK HERE TO VIEW THE FULL 2013 MotoGP Aragon: the Paddock Girls! The race was also marred by some controversy regarding Marquez’ clipping his Honda team mate in an hard overtake in his attempt to take back second, which caused the veteran rider’s rear tire traction control sensor to fail, and caused the highside. Fortunately Pedrosa was not seriously injured sustaining just bruising to his hip and groin, but Marquez is once again being investigated by the Race Direction, after being already docked two penalty points at Silverstone for a warm-up crash that put in danger Cal Crutchlow and the marshals. Marquez was sitting in pole postion, but it was Jorge Lorenzo who grabbed the lead and it looked like it would be a repeat of the Misano race, as the Yamaha rider pulled more than a half a second lead in the first seven corners of the first lap. However, this time the two Honda riders soon reeled him back in, with Pedrosa who turned 28 yesterday, overtaking Marquez for second, but the rookie wasn’t having any, as few laps later he tried to dive down the outside of his team mate, making a barely noticeable contact and running wide into the run-off area, while Pedrosa coming out of the corner seemingly unscathed, was then launched into the violent highside. Marquez’ error cost him almost a two second gap from Lorenzo, but he began chipping away at the leader’s margin, catching and passing him with relative ease with six laps remaining in the race. Lorenzo did try to chase him down for a few laps, but Marquez controlled the final laps to take the win by 1.3 seconds. With Pedrosa’s DNF, Valentino Rossi inherited third on the podium – a wrong front tire choice put him out of contention with the front frunners - but it wasn’t smooth sailing for the Italian, as he was enthralled in a heated and aggressive battle with Alvaro Bautista in the final laps. The two riders were joined by Stefan Bradl, but Rossi’s superior braking and cunning saw him take the podium, while thanking the LCR rider for running wide Bautista in the last corners in his desperate attempt to grab 4th. Yamaha Tech3s Cal Crutchlow and Bradley Smith were 6th and 7th respectively, while for Ducati duo Andrea Dovizioso and Nicky Hayden took 8th and 9th in another difficult race for the Italian manufacturer and Pramac’s Andrea Iannone completed the top 10, as Aleix Espargaro was once again the top CRT rider in 11th. Luca Scassa who was replacing injured Karel Abraham (who has been ruled out of the rest of the season) with Cardion AB Motoracing saw his MotoGP debut almost end on the opening lap when he was involved in an crash between PBM’s Michael Laverty and Came IodaRacing Project’s Danilo Petrucci. Australia’s Damian Cudlin who was replacing Yonny Hernandez in Avintia Blusens’ after the Colombian rider took injured Ben Spies spot in Pramac suffered gearbox issues and had to retire.